…there’s a huge surge in completely wireless earbuds that offer functionality like the Airpods but at a cheaper price. One such earbud that are completely void of wires and available at half the price of Apple Airpods are Smartomi Boots, and here’s my review of it. Before the launch of Apple Airpods, Rowkin was the brand that offered completely wireless earbuds, which were decent enough and a different product in the market. However now, consumers are spoiled with choices when it comes to true wireless earbuds, while most of them offer horrendous sound, Smartomi Boots are an excellent fit for your no-wires audio product inhibition. Let's move onto its design and performance! [Efficient Bluetooth 5. 0] - compared to other Bluetooth headphones with Bluetooth 4. 1 or 4. 2, Sound PEATS Q32 true wireless earbuds adopt Bluetooth 5. 0 to ensure stable connectivity and smooth transmission in high speed and long distance with low consumption. [Powerful charging case] - with built-in 2600mAh battery, the charging case can provide up to 18-20 full charge for both of the earbuds. Moreover, it is also a compact and portable Designed carrying case providing your earbuds The best protection. [Mono & stereo mode] - Sound PEATS Q32 true wireless earbuds support working with 2 devices separately in mono mode, or use together as a pair in stereo mode. With the wide compatibility, The earbuds with no wire between bring you nothing but convenience and enjoyment sharing. [Strong power in small size] - equipped with multi-size ear tips and ear tip with hooks, The ergonomic in-ear earbuds with light weight at 0. 47G per earpiece are always trying to provide you the maximum comfort and snug fit. 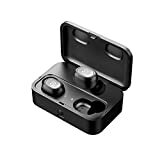 [Make it easier] - Sound PEATS Q32 true wireless earbuds fulfill all your needs about Bluetooth earphones with their large capacity battery, smooth transmission, built-in microphone, comfortable wearing and no wire tangling. Besides, Sound PEATS provides 12 months hassle-free warranty to ensure the enjoyment of your purchase. Smartomi Boots though being small have an unusual design and can be easily recognized as well. It comes with a small box that offers the wireless earbuds itself along with a charging cradle, 3 different sized eartips and earhooks, USB cable, and a carrying pouch as well that is good enough to store all the accessories inside. Both earbuds have a combined weight of close to 10 grams and efficiently stick to your earbuds, however slight amount of the earbud piece stick out and you might want to use the provided earhooks to keep the earbuds in place. Each earbud has two buttons, a microphone and indicator light as well. The included buttons offers power on/off functionality along with Bluetooth pairing. To get started with Smartomi Boot﻿﻿s, I recommend charging them before first use, once charged, the pairing process is quite easy as well. First power on the first earbud by holding the power button, later in your smartphone, 'enable Bluetooth' and select Smartomi Boots. Once paired, power on the second earbud and it will automatically pair with the first earbud. Do make sure the earbuds are close to each other while pairing for first time, later on the earbuds will automatically pair with the smartphone and themselves easily. The Smartomi Boots offer a battery life of 5 hours and standby time of 200 hours, however I would have loved if it could get charged a little quicker, as it takes couple of hours to get fully charged. Since it offers Bluetooth 4.1 technology, you get skip and lag free music, along with a better battery life as well. Soundwise the Smartomi Boots are better than its competitors, I’m surprised that being so small, they offer loud noise and are punchy as well. Though don’t expect them to offer sound quality close to wired earbuds under $100 at loud volumes but they sound excellent at 70% volume range. However to get utmost performance I’d suggest using the latest smartphone, because if you do use an old smartphone and notice lags in music then the culprit may be your smartphone. The earbud is great as well if you consider call quality and the microphone reception, alternatively you can use a single earpiece as well, while switching between listening music and taking calls. Who would have thought that one day you could get a complete wireless earbud that not only sounds exceptional for their size but also offer great built quality and functionality as well. Smartomi Boots though slight big are lightweight enough to sit in your ear without you even noticing them. The only major con using them would be, you might lose them anytime if you’re in rush or in a crowded place. ​If you have any questions related to Smartomi Boots, you can leave your thoughts in the comment section. If you liked our review then do consider sharing this on social media sites like Google+, Twitter and so on! Turtle Beach Recon 50X Review | Best Gaming Headset under $40? The Rounding Sound Copyright © 2019. TheRoundingSound.com is a participant in the Amazon Services LLC Associates Program, an affiliate advertising program designed to provide a means for website owners to earn advertising fees by advertising and linking to Amazon (.com, .co.uk, .ca etc) and any other website that may be affiliated with Amazon Service LLC Associates Program.